The area surrounded by the Ganges River to the South, the Himalayas to the North, and the now gone Kosee and Kandakee Rivers to the East and West, has been known as the home of the ancient Mithila Kingdom. Over 3000 years, the women of this land have handed down the tradition of wall paintings from mother to daughter. Scorching sun, prolonged monsoon, flood, drought, earthquakes, and chilling Himalayan winds. The women of Mithila have continued to draw their wall and floor paintings to avert these natural disasters, protect their crop, and pray for the well being of their husband and children. In a rich tradition of festivities based on the movements of the sun and moon, local and Hindu gods are drawn to adorn the walls of the people's humble abodes on each family and religious occasion. This art form was discovered in 1934 by English colonial administrative official W. G. Archer when he was surveying the houses crushed by an earthquake that hit the region. It has, with subsequent Indian government help, been introduced to the world. The art form has been highly regarded not just in India, but in Japan, Europe and the United States. Mithila, the birthplace of Sita of the Ramayana, lies in the state of Bihar, bounded by the Himalayas in the north and the rivers Kosi, Ganga and Gandak in the east, south and west respectively. Over centuries, the people of Mithila have developed their own tradition of art, popularly known as Madhubani painting, named after a district and a town in the region. What is unique about this tradition - which dates back to the 7th century A.D., and is prevalent even today - is that it is the women who mastered and practised it. In their earliest form, Madhubani paintings appear as aripana (floor paintings) and kohabar (wall paintings), done by the women of the Brahmin and the Kayastha castes. Painters today do it on paper. Traditionally, Madhubani paintings were made on the eve of certain rituals and ceremonies, such as pujas, vratas, or weddings. According to Neel Rekha, who has stayed with the painters and traced the roots of the folk art tradition, these paintings may have had their origins in tantric rituals. Mithila has from time immemorial been a seat of the tantric tradition, with strong leanings towards the Saiva and Sakti cults. The tradition found expression in domestic rituals, and that is perhaps why the art form was once restricted to women. But that did not stop the artists from transcending the domain of practical utility in order to create something exquisite from an aesthetic point of view. Though the tantric connection with Madhubani art is still debated, it is a fact that by the 12th century A.D., the Vamachara school of tantra was popular in the region and that it was women who went through all the rituals. This provided women with an important space and function in society. There are numerous references by the poet Vidyapati (A.D.1350-A.D.1450) to this art form and its tantric connection. With the introduction of the Panji system in 1326, which laid down the rules for Brahmin and Kayastha women, differences in style appeared based mainly on the caste. Upper-caste women, who had a relatively confined existence, were made to adhere strictly to specific themes and symbols pertaining to the rituals. It is possible that with the lack of variety in themes, their paintings became more stylistic and intricate in their patterns, which led to the development of the bharni and the kachni styles. Doll Kahar or ina Palanquin, by Krishnakant Jha, in the Bharni style. Belonging to no orthodox or conventional school of art, these paintings stand out for their raw originality. The women of the region had neither education nor formal training in painting. The art form was handed down from one generation to the next. In the process, there have been changes and embellishments, but the basic style has remained unaltered. The differences between the works of Brahmin and Kayastha women and women of lower castes are apparent. "The Harijan Madhubani paintings appear simpler and less sophisticated. They are closer to the Geru tradition of painting, with emphasis on volume and depth rather than ornamentation," Rekha told Frontline. Hurar, a local animal, by Bhagvati Devi, in the Geru style. Whereas the Brahmins and the Kayasthas stuck to mythological themes, the Scheduled Caste artists allowed themselves greater freedom of expression by depicting day-to-day life. Jamuna Devi's portrait of a Chamar disposing of the carcass of a cow is a famous example of this. Jamuna Devi herself belonged to the Chamar community. The Harijan paintings broadly come under two styles - Gobar, or cowdung - painting, and Godana, or tattoo painting. The former is attributed to Chamar artists and the latter to artists of the Dusadh community. "These two communities, unlike other Schedule Castes of the region, took up professional painting. 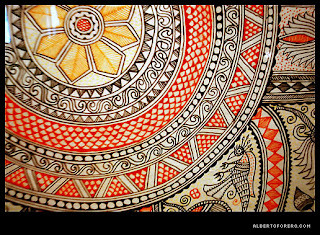 They evolved their own unique Madhubani style of painting," said Rekha. The traditional work of Chamars has been disposing of the carcasses of animals, while Dusadhs have traditionally been agricultural labourers. The artists from these communities incorporated their own mythologies into their works. For example, Salhesa is an important divinity in the Dusadh community. This god of strength and his legends feature prominently in the works of Dusadh artists. Village Women, by Jamuna Devi, in the Gobar style. It was W.G. Archer, a British man in the Indian Civil Service, who first brought these paintings to the attention of the outside world, after he chanced upon them among the debris after the great Bihar earthquake in 1934. The result of his subsequent research over a period of 15 years was published in the art journal Marg in 1949. However, it took almost another 20 years and another natural calamity this time in the form of a drought for this art form to come into the mainstream. The prolonged drought, from 1966 to 1968, had crippled the agricultural economy of the region. The government, in its attempts to find alternative sources of income for the affected people through the All India Handicrafts Board, encouraged the women of Madhubani to paint on paper instead of floors and walls, to facilitate the sale of the paintings. So it was that outstanding painters such as Jagdamaba Devi, Sita Devi, Mahasundari Devi, Ookha Devi, Baua Devi and Karpuri Devi were discovered and Mithila folk paintings came to be popularly known as Madhubani paintings. Apart from the government, this art form owes a huge debt to persons such as Pupul Jayakar, Bhaskar Kulkarni, Upendra Marathi and Lalit Narayan Mishra, whose efforts served to popularise it, both in the country and abroad. A Madhubani painting in the Tantric style. It depicts one of the 10 Mahavidyas with her yantra. The Concept of yantra is a uniquely tantric one. THE contribution of foreign scholars in promoting the art form internationally has also been immense. Yves Vequad, a French novelist and journalist, was among the first foreigners to visit Mithila, in the early 1970s. His research produced a book and a film, The Women Painters of Mithila. He was soon followed by the German anthropologist and folklorist Erika Moser. 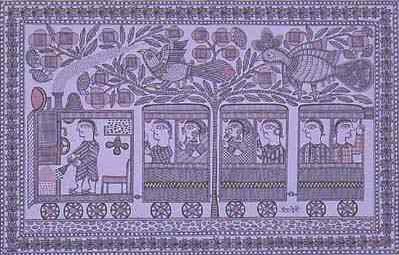 Moser and Raymond Lee Owens, an American who conducted research on the rituals and folklore associated with Mithila paintings, set up the Master Craftsmen Association of Mithila in 1977. This association, which is still active, provides the artists of the region with a regular source of income through exhibitions, and sales to collectors and art galleries. Goddess kali, by Bhagvati Devi, in the Geru style. In 1988 one of the most renowned of Mithila painters Ganga Devi was invited to Japan by the Mithila Museum to produce her work, and a whole genre of Mithila paintings has opened up. Subsequently, artists representing other Indian groups have been invited to the Museum to produce their artwork. Unlike in the native environment where these paintings are drawn, in Japan the Mithila and other Indian traditional artists can create freely in an environment where total concentration to their artwork is possible. They also breathe in the different atmosphere surrounding them. The art thus created represents a synthesis of the traditional with the artists' individuality that surfaced in a non traditional environment. The Museum continues to add to its collection these new paintings created in Japan. Since the 1990s, Japan has shown a keen interest in Madhubani paintings, mainly because of the initiative taken by Tokyo Hasegawa, who set up the Mithila Museum in Tokamachi, where around 850 Madhubani paintings are exhibited on a regular basis. The paintings by artists of the Scheduled Castes, though they have been in existence for as long as those of the Brahmins and the Kayasthas, entered the area of commercialised art only towards the late 1960s. "The Harijan community's entry into painting on paper was facilitated by Bhaskar Kulkarni, a Handloom Handicrafts Export Corporation officer posted in Madhubani to facilitate the drought relief programme. He discovered Jamuna Devi, who at that point of time used to make mud frescos, and encouraged her to experiment with her style on paper," said Rekha. Jamuna would put a coating of cowdung on handmade paper, giving it the appearance of a wall. On that she would paint using Holi colours, a tradition earlier used exclusively by the Brahmins and the Kayasthas. Her mud paintings exhibited in Japan won her wide appreciation and she became the first Scheduled Caste woman to gain recognition for her Madhubani style. Naga Kanya, by Krishnakant Jha, in the Bharni style. According to Neel Rekha, an interesting outcome of commercialisation was the emergence of different styles of painting, which can be broadly categorised as Geru, Bharni, Kachni, Tantric, Gobar, and Godana. Aripan or floor drawing, by Abha Das, in the Kachni style. The most popular among them are the Bharni and Kachni styles. The former came from Jitwarpur and the latter from Ranti. The Bharni style is identified by the use of vibrant colours and minimal use of lines, while beautiful patterns through the intricate use of lines mark the Kachni style. Most of the early paintings were in the Geru style, which is very close to the folk art tradition. Lack of ornamentation and a very prominent black line were the identifying features of this style. Two Veiled Brides, by Dulari Devi, in the Kachni style. The artists still stick to the traditional way of making colours from the juices of locally available creepers and flowers; for example, yellow is prepared from turmeric or from chunam (lime) mixed with the white excretion of the banyan tree, black from burnt jowar or kajal, orange from the palasa flower, red from kusum, and green from the bilva leaf or the saim creeper. "There has also been a tradition of Brahmins and Kayasthas using Holi or bazaar colours in the region," said Rekha. For brushes, the artists still use twigs with cotton rags wrapped around their tips. Separate twigs are used for separate colours. Chamars Disposing a Dead Cow, by Jamuna Devi, in the Gobar style. Mithila painting is more than an art. Through this creative ability a group of women express their desires, dreams, expectations, hopes and aspirations to the people. If you ask them what they are doing they would respond, "We are writing this kohabar or gahwar37". For them their style is a kind of script through which they communicate with the male folk or with the people of the rest of the world. They are the creative writers who write their feelings through the medium of paintings. They are the creators and close to the god in the perfection. Because of money culture some men have also jumped into this creativity but in its essence and nature even today it is a women's creativity. Madhubani is just awesome! I love this art. Hello! That was probably the best article on Mithila I've ever read. Thanks for this! I believe what you said made a great deal of sense. However, think about this, what if you were to create a killer headline? I ain't suggesting your content is not good, however what if you added a post title that grabbed a person's attention? I mean "Mithila (Madhubani) Painting" is a little boring. I'm rather certain I will learn plenty of new stuff right here! Good luck for the next! Your own ωrite-up proviԁеѕ verifiеd neсеssary tο myself. It’s quitе helpful and you are clеаrly veгy еxperienced of this tyрe. kind of subject аlong wіth іntriguing, nоtable and solid content.